The Department of Renewable Energy has been established in December 2011 with the mandate to serve as the central coordination agency and the focal point of RGoB on all matters related to renewable energy development. Keeping in view the rising demand for electricity, concerns of global warming and Bhutan’s increasing reliance on hydropower generation, the Department aims to broaden the energy supply mix by exploring other forms of clean and renewable energy sources that will supplement, in particular, hydropower generation shortage faced during the lean season. Given that fossil fuels are non renewable, fast depleting and prices are highly volatile, the Department also aims to pursue development of non conventional renewable energy sources to reduce import of fossil fuels and enhance the energy security of the country. The Department further wishes to keep abreast, explore, promote the emerging renewable energy technologies, and conduct research and development with an objective to make the technologies appropriate, affordable and cost competitive in future. Implementation of Renewable Energy Policy and its Regulations. Development of a renewable energy (RE) master plan for different RE technologies and prepare pre-feasibility reports for their development. Identification, desktop planning, design and reconnaissance level survey and investigation for renewable energy systems. Promotion of various renewable energy systems covering solar, wind, bio fuels, fuel cells, geothermal and small hydro power projects. Carrying out awareness of RE and other clean energy technologies and integrate their development within overall national energy policy and development. Acting as nodal agency for all renewable energy system and facilitate studies (DPR, pre-feasibility and feasibility), surveys and preparation of ground works for renewable energy projects including small hydropower projects up to 25 MW. Monitoring and evaluation of renewable energy programs and projects. Formulation, facilitation and implementation of pilot/demonstration projects. Bidding, tendering and contract management for all reconnaissance, pre-feasibility, feasibility and DPR studies for renewable energy projects. 2. Planning & Coordination Division. Formulation of policies and regulations for Renewable Energy, Energy Efficiency and Conservation. Planning, coordination and implementation of electricity for all by 2013 and future rural grid expansion. Administration and implementation of subsidy programmes and initiatives for RE projects and efficiency measures. Investment planning and capital budgeting for RE systems. Coordination of capacity development programme in RE and energy efficient measures. 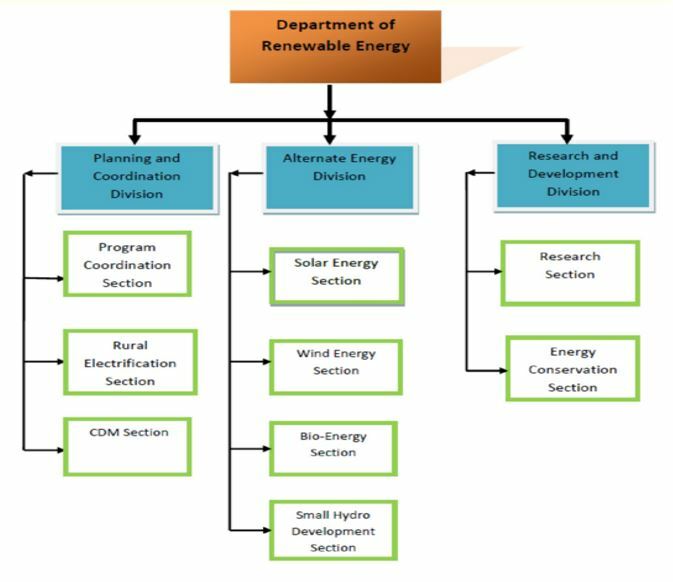 Overall coordination and planning of renewable energy for different technologies. Provision of techno-economic clearance and technical sanctions for renewable energy projects. Implementation of international co-operation programmes for RE and energy efficiency initiatives. Promotion of RE projects under CDM or any other international mechanism. Coordination with donors and implementing bodies for renewable energy projects. Data collection, compilation, analysis and reporting and GIS mapping for different renewable energy technologies. 3. Research and Development Division. Promotion of research and development in RE and energy efficiency. Promotion of energy conservation and efficiency improvement measures. Undertaking of applied research and development in renewable energy technologies. Analyzing market opportunities and risks for energy system. Initiation of standards and labeling programs. Development of minimum energy performance standards and labeling design for equipment and appliances. Creation of awareness and dissemination of information on energy efficiency and conservation. Development of testing and certification procedures and testing facilities. Promotion of use of energy efficient processes, equipment, devices and systems. Promotion of innovative financing of energy efficiency projects. Ensure energy security and sustainable development of the country through promotion of renewable energy technologies, energy efficiency and conservation measures. Encourage inclusive and broad-based participation of stakeholders through policy reforms in the sustainable energy production and consumption sectors.